The aim of the present study was to review left ventricular (LV) deformation in idiopathic-dilated cardiomyopathy (DCM). The following data sources were searched: medical text books, medical journals, and medical websites that have updated researches with keywords 'left ventricle speckle tracking' in the title of the article. Systematic reviews that addressed LV speckle tracking and studies that addressed idiopathic-DCM were selected for the presents study. 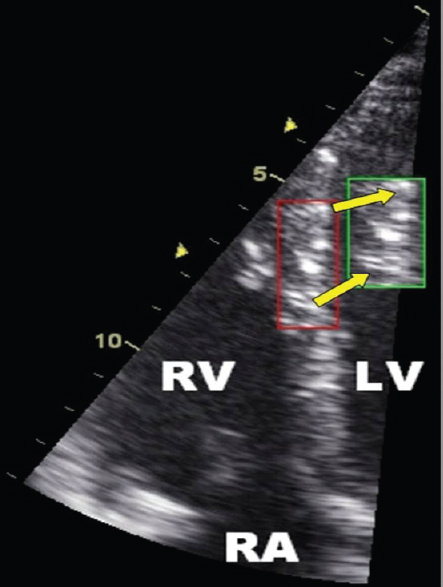 A special search was conducted at midline with the keywords 'left ventricle speckle tracking' in the title of the paper; extraction was performed, including the assessment of the quality and the validity of the papers that fulfilled the prior criteria that described the review. Each study was reviewed independently; the data obtained were rebuilt in a new language according to the need of the researcher and arranged into topics through the article. 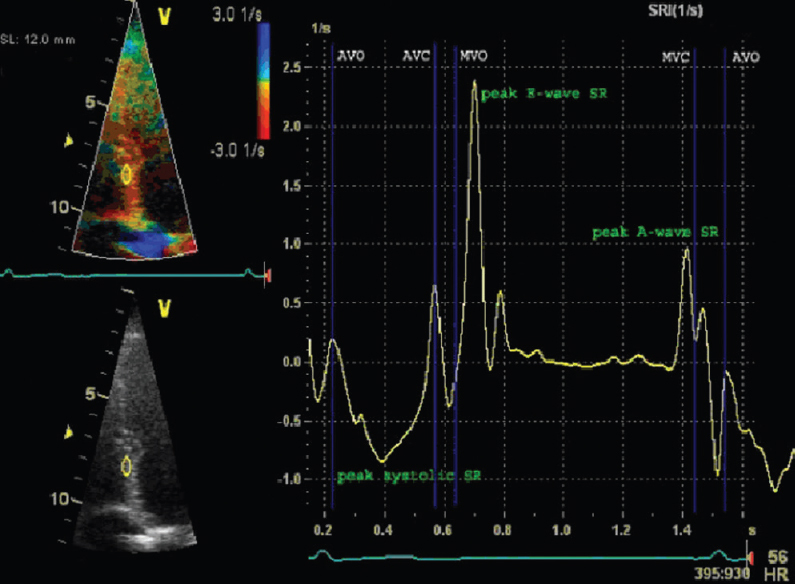 Speckle tracking echocardiography is an ideal tool for the assessment of the LV because of its regional and global functional characterization, angle independence, and high temporal resolution. The dimensions and function of the LV have been proven to be important indicators of LV impairment, primarily in patients with LV pressure and/or volume overload. This includes mainly patients with cardiomyopathy, heart failure, congenital heart disease, pulmonary hypertension, coronary artery disease, or arrhythmia. LV speckle tracking would be an interesting diagnostic and prognostic entity to study DCM. Dilated cardiomyopathy (DCM) is a progressive, usually irreversible, disease causing heart failure, left ventricular (LV) dysfunction, ventricular and supraventricular arrhythmias, conduction system abnormalities, thromboembolism, and sudden death . DCM is one of the cardiomyopathies, a group of diseases that primarily affect the myocardium. Different cardiomyopathies have different causes and affect the heart in different ways. In DCM a portion of the myocardium is dilated, often without any obvious cause . The DCM is often viewed as 'a final common pathway' of numerous types of cardiac injuries and is the most common cardiomyopathic phenotype . In this condition, global LV systolic dysfunction occurs in the absence of hypertension, valve disease, or significant coronary artery disease . The clinical presentation and course varies as some patients are completely asymptomatic and others experience sudden cardiac death, especially among those adolescent children where DCM is the leading cause of death during exertion. . Different studies report wide-ranging estimates of annual mortality that are between 10 and 50% . When diagnosing DCM, it is important to review the major etiologic and pathophysiologic classes responsible for this disorder [alcohol/toxic, certain specific cardiomyopathies (general systemic disease, hypertensive, ischemic, metabolic, muscular dystrophies, neuromuscular disorders, peripartal and toxic reactions, valvular), familial/genetic, idiopathic, viral and/or immune]. DCM can be familial or genetic in origin (secondary or idiopathic). Some progress has been made in characterizing the molecular genetics of DCM . During systole, the normal ventricular myocardium simultaneously shortens in the longitudinal and circumferential planes and thickens in the radial plane, with reciprocal changes during diastole. Deformation imaging, in the broadest sense, allows for more direct assessment of myocardial muscle shortening and lengthening throughout the cardiac cycle by assessing regional myocardial strain and strain rate (SR). Strain is defined as the change in length of a segment of the myocardium relative to its resting length and is expressed as a percentage; SR is the rate of this deformation. Longitudinal and circumferential shortening results in negative strain values, whereas radial thickening results in a positive strain value . The guidance published by the Centre for Reviews and Dissemination was used to assess the methodology and outcomes of the studies. This review was reported in accordance with the Preferred Reporting Items for Systematic reviews and Meta-Analyses statement. The institutional review board and ethics committee of Menoufia University approved this study. A systematic search of several bibliographical databases was performed to identify relevant reports in any language. These included MEDLINE, Cochrane Database of Systematic Reviews, Cochrane Central Register of Controlled Trials, TRIP database, Clinical Trials Registry, ISI Web of Knowledge, and Web of Science. Articles electronically published ahead of print were included. The search was performed in the electronic databases from the start of the database up to 2016. All the studies were independently assessed for inclusion. Studies conducted on patients with DCM, in which assessment of LV by two-dimensional speckle tracking was carried out, and which included the outcomes of regression of LV mechanics were included in the present review. If the studies did not fulfill the above criteria, they were excluded. Articles in non-English languages were translated. The article title and abstracts were screened initially, and then, the selected articles were read in full and further assessed for eligibility. All references from eligible articles were reviewed to identify additional studies. Study quality assessment included whether ethical approval was gained, the prospective design, the specified eligibility criteria, whether appropriate controls were used, whether adequate follow-up was achieved, and defined outcome measures such as changes in LV mechanics. The quality of all the studies was assessed. Important factors included the prospective study design, attainment of ethical approval, evidence of a power calculation, the specified eligibility criteria, appropriate controls, specified outcome measures, and adequate follow-up. It was expected that confounding factors would be reported and controlled for and appropriate data analysis would be made in addition to an explanation of the missing data. Because of the heterogeneity in postoperative follow-up periods and outcome measures reported, it was not possible to pool the data and perform a meta-analysis. Comparisons were made by through a structured review. In this study we sought to determine, for the first time, LV deformation in DCM by two-dimensional speckle tracking echocardiography (STE). Myocardial strain is the dimension-less index of the change in myocardial length in response to an applied force. SR is the time derivative of strain with unit of per se cond, and in ultrasound it represents the differential velocity of two points normalized for the distance between them . The diagnosis of DCM was based on echocardiographic criteria of increased diastolic and systolic volume and a low (<45%) ejection fraction (EF), as defined by the WHO . Echocardiographic diagnosis of idiopathic-DCM was based on the following criteria: the presence of an EF of less than 0.45 or fractional shortening of less than 0.25 and a LV end-diastolic diameter more than 117% of that expected for the patient's age and body surface area. . The DCM phenotype is often viewed as 'a final common pathway' of numerous types of cardiac injuries and is the most common cardiomyopathic phenotype . DCM is characterized by ventricular enlargement and systolic dysfunction with greater LV cavity size (end-diastolic LV dimensions are usually > 65 mm) with little or no wall hypertrophy. Hypertrophy is judged as the ratio of LV mass to cavity size; ratio is decreased in persons with DCMs . The enlargement of the remaining heart chambers is primarily due to LV failure, but it may be secondary to the primary cardiomyopathic process. Right ventricular dilatation and dysfunction may be present but are not necessary for the diagnosis . Echocardiography has become one of the most useful and efficient diagnostic modalities in the diagnosis and classification of cardiomyopathy . Two-dimensional echocardiography can assess the overall function. M-mode assists in the measurement of chamber sizes and wall thickness (end-diastolic LV dimensions are usually >65 mm in patients with DCM). 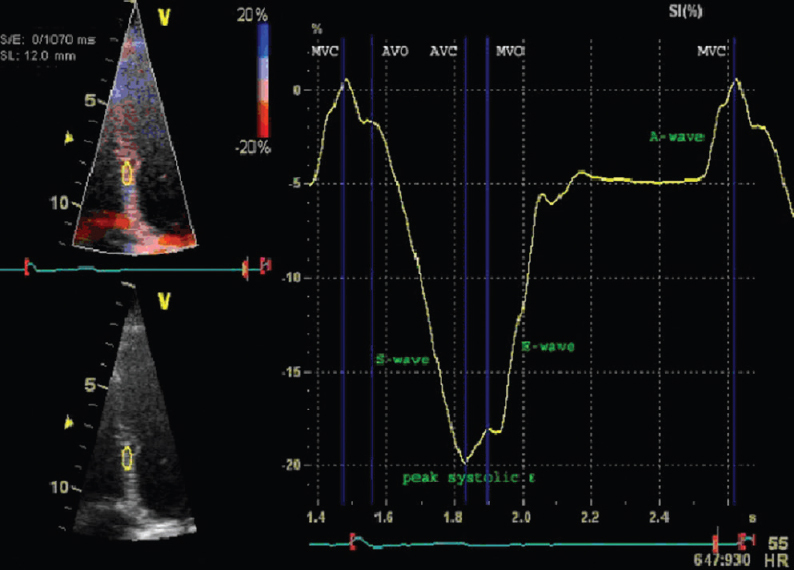 Doppler echocardiography can assess the flow and valvular pathologies. It also allows for measurements of diastolic and systolic dynamics. The physician must look for the reversal of the E-wave-to-A-wave ratio when evaluating LV filling and pulmonary venous flow by Doppler echocardiography during left atrial filling. 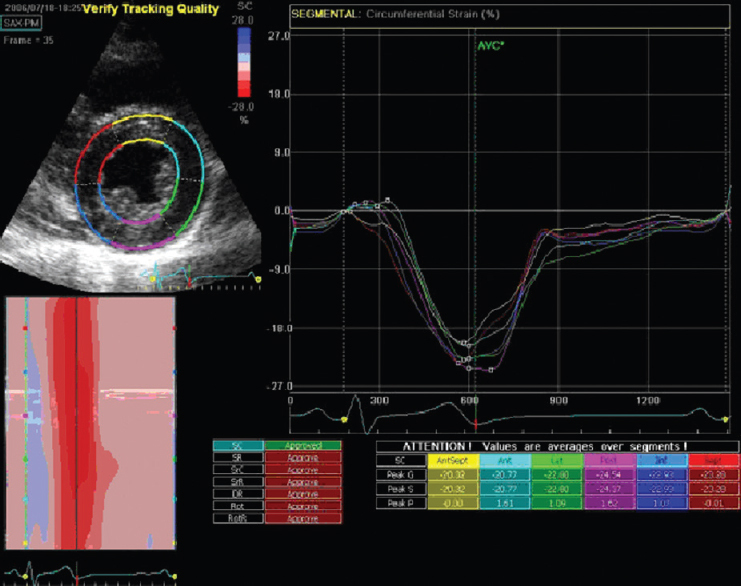 More recently, tissue Doppler interrogation has been used in many cardiac ultrasound laboratories; this modality measures the velocity of portions of the heart wall, most often the LV basilar annular area. Just as in the blood velocity parameters of E and A amplitudes, similar measurements of wall velocity (E' and A') are made. Reversal of the E'/A' amplitude signifies diastolic dysfunction. Segmental wall motion abnormalities may suggest an ischemic etiology for the cardiomyopathy. While ischemic cardiomyopathy is a common cause of such abnormalities, however, they can often be observed in association with other forms of cardiomyopathy as well. Echocardiography is used to help differentiate DCM from restrictive and hypertrophic cardiomyopathy. Dilated chambers and thin walls are the most prominent features of DCM . Following electromechanical activation, the myocardium deforms during systole because of sarcomere shortening. This active deformation causes a reduction in intracavitary size, resulting in the ejection of blood from the ventricle. During diastole the original ventricular geometry is restored because of active relaxation and passive filling following atrial contraction. As myocardial tissue is virtually incompressible, the volume of the ventricular wall remains the same during the cardiac cycle and, thus, deforms in three dimensions. During systole there is three-dimensional deformation, which can be expressed in three ventricular coordinates: a longitudinal shortening, a circumferential shortening, and a radial thickening . Cardiac function is traditionally measured with transthoracic echocardiography via volumetric measures of cavity size (end-diastolic volume and end-systolic volume , mass, and EF). Although they are well validated parameters and have diagnostic and prognostic significance, EF and volume are load-dependent . EF varies when the heart lengthens or shortens. Moreover, volume, mass, and EF give an estimate of the global myocardial function with no or very little information about the regional function of the myocardium. Strain is a measure introduced relatively recently in the cardiac community, which, if considered in one dimension, is due to change in length (L) of an one dimension object relative to its original length. It is described by the formula: E=(L − Lo)/Lo, where E indicates strain, Lo indicates original length, and L indicates final length . In contrast to tissue Doppler imaging-derived parameters, speckle tracking is an angle-independent technique as the movement of speckles can be followed in any direction. For the apical views this implies that not only longitudinal but also transverse parameters can be calculated, which is not possible in tissue Doppler imaging recordings. In short-axis images both circumferential and radial parameters can be calculated for all myocardial segments. In addition to the circumferential deformation parameters, ventricular rotation and twist (additional parameters for LV function) can also be calculated using this technique . Several methods of strain measurement have been reported in experimental literature , but myocardial strain is principally measured through color Doppler methods and, more recently, STE . Doppler-derived strain is a robust, easily available, relatively reproducible technique. However, for accurate data recording it requires a high frame rate  (100–150 frames/s) and is angle-dependent , as well as being affected by translational movements and tethering. STE is a cutting-edge technique with huge potential for transforming cardiology practice . It is robust, reproducible, accurate, and free of angle of insonation, and the frame-rate requirement is not as high (60–90/s). Speckle tracking has been shown to have good interobserver and intraobserver variability . It has been validated against sonomicrometry and cardiac magnetic imaging. STE tracks tissue 'signatures' or ultrasound image texture formed by attenuation, reflection, and refraction of sound waves from the myocardium. When sound waves come into contact with the human body, they get scattered by ribs, lungs, myocardium, air, tissue interfaces, and the blood. Some of the sound waves are attenuated by losing their intensity while penetrating the tissues. These waves that are scattered are in a decoherent form, which means the crest of one falls over the trough of the other at some places, and vice versa. At some places they cohere (add up), whereas at others they decohere (nullify each other). Despite this coherence and decoherence, there are some waves of very small wavelength, smaller than the resolution of the imaging system. They form the 'noise' in the imaging process. When subsequent processing steps are applied, these noisy waves have a mottled appearance, and this is what has been called the 'speckle pattern.' These speckles are assigned a functional unit called a 'kernel,' which is then used in tracking the myocardium throughout the cardiac cycle. The other half of the picture 'tracking' or spatial dislocation is even more interesting. The speckles can be used to track the movement of the underlying myocardium from which they originated. Because these speckles are formed from subresolution wavelength waves, they represent fine fingerprints of the underlying myocardium. Complex algorithms can be applied to track these speckles. Although the algorithms involved are beyond the scope of this article, in essence the statistical methods used are similar to block-matching and autocorrelation techniques [Figure 1] and [Figure 2] ,. Figure 1: Typical speckled pattern of the myocardium of the left ventricle. LV, left ventricle; RA, right atrium; RV, right ventricle; N.B. yellow arrows point to the kernel. When visualized in a graph [Figure 3], the different phases of the cardiac cycle can usually be identified. During systole, the strain values become more negative (S-wave) with the negative peak at the aortic valve closure, representing the maximal longitudinal myocardial shortening during contraction (or peak systolic strain). During diastole, the strain values return toward 0 (toward the original length of the analyzed myocardial segment at the onset of the cardiac cycle) in three phases: (i) the early or rapid-filling phase (E-wave), followed by (ii) a plateau phase, or diastasis, and finally (iii) atrial filling (A-wave) . Figure 3: Longitudinal strain in the interventricular septum in a healthy person . The speed at which the myocardial deformation occurs is the SR and is expressed in S -1. SR depicts the change in strain over a period of time. Thus, when the myocardium shortens there is a negative SR and, the steeper the slope of the strain-curve, the higher the SR values. The peak systolic SR correlates well to loading independent indices of contractility and hence provides valuable information on regional contractile function . Compared with strain, when plotted in a graph [Figure 4] the different cardiac phases can be recognized, in systole a negative deflection indicating myocardial shortening with a peak systolic SR at the steepest part of the strain-curve, and in diastole two positive deflections, the E-wave and A-wave and diastasis when no change in strain occurs . Figure 4: Longitudinal strain rate in the interventricular septum in a healthy person . For each myocardial segment, velocity, displacement, strain, and SR are calculated in two dimensions, longitudinal and transverse parameters in the apical recordings and circumferential and radial parameters in the parasternal recordings [Figure 5] . Figure 5: Circumferential strain calculation on a short-axis recording. . The following diseases are candidates for the study of the LV through STE. In patients with nonobstructive hypertrophic cardiomyopathy and a preserved EF, STE has shown the capability to identify early major abnormalities of all strain components of myocardial deformation (longitudinal, circumferential, and radial strain) . In their study, Choi et al. reported that a lower longitudinal strain value in asymptomatic patients without wall motion abnormalities is a strong predictor of stable ischemic cardiomyopathy. Speckle tracking analysis in patients with valvular heart disease has been mainly performed for the evaluation of LV function with stress (exercise or pharmacologic) testing . It has been shown that in hypertensive patients with heart failure and in patients with heart failure and normal EF, LV longitudinal strain progressively deteriorates from New York Heart Association class I–IV, with additional LV radial and circumferential systolic impairment occurring in New York Heart Association functional classes III and IV . A recent study showed that longitudinal two-dimensional SR imaging is a promising potential echocardiographic parameter for predicting benefits from cardiac resynchronization therapy in patients with heart failure . STE appears to be a reliable tool to detect early subtle cardiac involvement in different clinical settings such as connective tissue diseases . Speckle tracking of the LV is an emerging modality with many avenues and vistas for cardiologists to explore. LV deformation is greatly correlated to severity of phenotype. STE has a discriminative power as a single measure to detect LV dysfunction in DCM. The prognostic significance of these findings should be addressed in future studies. Maron BJ, Towbin JA, Thiene G, Antzelevitch C, Corrado D, Arnett D, Leitman T. Contemporary definitions and classification of the cardiomyopathies: an American Heart Association Scientific Statement from the Council on Clinical Cardiology, Heart Failure and Transplantation Committee. Circulation 2006; 113:1807–1816. Jameson JN, Kasper DL, Harrison TR, Braunwald E, Fauci AS, Hauser SL, Longo DL. Harrison's principles of internal medicine. 16th ed. New York, NY: McGraw-Hill Medical Publishing Division; 2005: 567–577. Mann DL, Bristow MR. Mechanisms and models of heart failure: the biochemical model and beyond. Circulation 2005; 111:2837. Elliott P, Andersson B, Arbustini E, Bilinska Z, Cecchi F, Charron P, Hatle K Classification of the cardiomyopathies: a position statement from the European Society Of Cardiology Working Group on Myocardial and Pericardial Diseases. Eur Heart J 2008; 29:270–276. Harmon WE, McDonald RA, Reyes JD, Muraru D. Pediatric transplantation, 1994–2003. Am J Transplant 2005; 5:887–903. Levy WC, Mozaffarian D, Linker DT, Torp F. The Seattle heart failure model: prediction of survival in heart failure. Circulation 2006; 113:1424. Burkett EL, Hershberger RE. Clinical and genetic issues in familial dilated cardiomyopathy. J Am Coll Cardiol 2005; 45:969–981. Daubeney PE, Nugent AW, Chondros P, Carlin JB, Colan SD, Cheung M, et al. Clinical features and outcomes of childhood dilated cardiomyopathy: results from a national population-based study. Circulation 2006; 114:2671–2678. Leitman M, Lysyansky P, Sidenko S, Cramer MJ. Two dimensional strain – a novel software for real-time quantitative echocardiographic assessment of myocardial function. J Am Soc Echocardiogr 2004; 17:1021–1029. Richardson P, McKenna W, Bristow M, Leano R. Report of the 1995 World Health Organization/International Society and Federation of Cardiology Task Force on the definition and classification of cardiomyopathies. Circulation 1996; 93:841–842. Pieske B. Reverse remodeling in heart failure – fact or fiction?. Eur Heart J 2004; 89(Suppl 6):D66–D78. Lindenfeld J, Mann DL, Boehmer JP. Executive summary HFSA 2010 comprehensive heart failure practice guideline. J Card Fail 2010; 16:475–539. Weidemann F, Jamal F, Sutherland GR, Claus P, Kowalski M, Hatle L, Wang J. Myocardial function defined by strain rate and strain during alterations in inotropic states and heart rate. Am J Physiol Heart Circ Physiol 2002; 283:792–799. Pombo JF, Troy BL, Russell RO Jr. Left ventricular volumes and ejection fraction by echocardiography. Circulation 1971; 43:480–490. Carabello BA. Evolution of the study of left ventricular function: everything old is new again. Circulation2002; 105:2701–2703. Ogawa Y, Nakao K, Mukoyama M, Cho SJ. Natriuretic peptides as cardiac hormones in normotensive and spontaneously hypertensive rats: the ventricle is a major site of synthesis and secretion of brain natriuretic peptide. Circ Res 1991; 69:491–500. Korinek J, Wang J, Sengupta PP, Miyazaki C, Kjaergaard J, McMahon E, et al. Two-dimensional strain: a Doppler-independent ultrasound method for quantitation of regional deformation: validation in vitro and in vivo. J Am Soc Echocardiogr 2005; 18:1247–1253. Blessberger H, Binder T. Non-invasive imaging: two-dimensional speckle tracking echocardiography: basic principles. Heart 2010; 96:716–722. Hanekom L, Cho GY, Leano R, Attena E. Comparison of two-dimensional speckle and tissue Doppler strain measurement during dobutamine stress echocardiography: an angiographic correlation. Eur Heart J 2007; 28:1765–1772. Dandel M, Lehmkuhl H, Knosalla C, Trotta T. Strain and strain rate imaging by echocardiography – basic concepts and clinical applicability. Curr Cardiol Rev 2009; 5:133–148. Urheim S, Edvardsen T, Torp H, Angelson B, Smiseth OA. Myocardial strain by Doppler echocardiography: validation of a new method to quantify regional myocardial function. Circulation 2000; 102:1158–1164. Nesser HJ, Mor-Avi V, Gorissen W, Arbustini E. Quantification of left ventricular volumes using three-dimensional echocardiographic speckle tracking: comparison with MRI. Eur Heart J 2009; 30:1565–1573. Teske AJ, de Boeck BW, Melman PG, Sieswerda GT, Doevendans PA, Cramer MJ. Echocardiographic quantification of myocardial function using tissue deformation imaging, a guide to image acquisition and analysis using tissue Doppler and speckle tracking. Cardiovasc Ultrasound 2012; 5:27. Peluso D, Badano LP, Muraru D, Longo DM. Left ventricular size and function assessed with three-dimensional and speckle-tracking echocardiography in 200 healthy volunteers. Eur Heart J Cardiovasc Imaging 2013; 14:1106. Weidemann F, Jamal F, Sutherland GR, Claus P, Kowalski M, Hatle L, et al. Myocardial function defined by strain rate and strain during alterations in inotropic states and heart rate. Am J Physiol Heart Circ Physiol 2012; 283:H792–H799. Teske AJ, de Boeck BWL, Olimulder M, Prakken NH, Doevendans PA, Cramer MJM. Echocardiographic assessment of regional right ventricular function. A head to head comparison between 2D-strain and tissue Doppler derived strain analysis. J Am Soc Echocardiogr 2007; 130:319–325. Esch BT, Warburton DE. Left ventricular torsion and recoil: implications for exercise performance and cardiovascular disease. J Appl Physiol 2009; 106:362–369. Choi JO, Cho SW, Song YB, Cho SJ, Song BG, Lee SC, Park SW. Longitudinal 2D strain at rest predicts the presence of left main and three vessel coronary artery disease in patients without regional wall motion abnormality. Eur J Echocardiogr 2009; 10:695–701. Lancellotti P, Cosyns B, Zacharakis D, Attena E, van Camp G, Gach O, et al. Importance of left ventricular longitudinal function and functional reserve in patients with degenerative mitral regurgitation: assessment by two-dimensional speckle tracking. J Am Soc Echocardiogr 2008; 21:1331–1336. Kosmala W, Plaksej R, Strotmann JM, Weigel C, Herrmann S, Niemann M, et al. Progression of left ventricular functional abnormalities in hypertensive patients with heart failure: an ultrasonic two-dimensional speckle tracking study. J Am Soc Echocardiogr 2008; 21:1309–1317. Conca C, Faletra FF, Miyazaki C, Oh J, Mantovani A, Klersy C, et al. Echocardiographic parameters of mechanical synchrony in healthy individuals. Am J Cardiol 2009; 103:136–142. 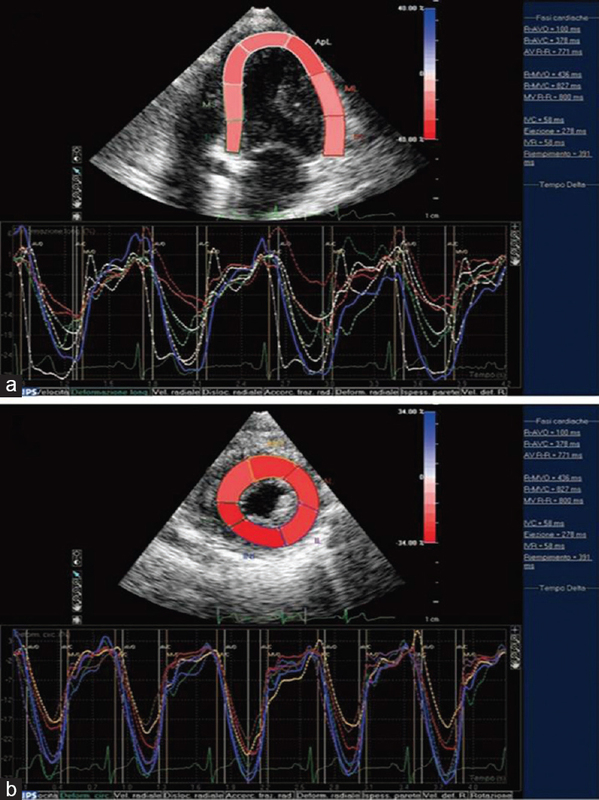 Sitia S, Tomasoni L, Criseo M, Trotta G, Turiel M. Speckle tracking echocardiography for detection of subclinical cardiac involvement in rheumatoid arthritis. Eur J Echocardiogr 2009; 10:S131.